Thu, Sep 6, 2018, 11:20 pm SL Time, ColomboPage News Desk, Sri Lanka. 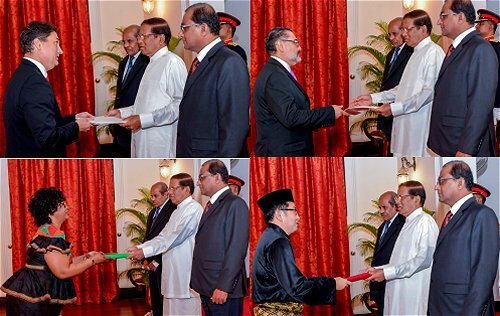 Sept 06, Colombo: Two new Ambassadors and two High Commissioners presented credentials to President Maithripala Sirisena on Thursday at a ceremony held in the President's House, Colombo. The new diplomats assuming duties were Ambassador of the Swiss Confederation Mr. Hanspeter Mock, Ambassador of the Republic of Guatemala Mr. Giovanni Rene Castillo Polanco, High Commissioner of the Republic of Zambia Mrs. Judith Kang'oma Kapijimpanga and High Commissioner of Malaysia Mr. Tan Yang Thai. Foreign Affairs Minister Tilak Marapana and Secretary to the President Udaya R. Seneviratne were also present at this occasion.